As soon as I push the spoon under his nose, he turns away. It’s as if the spoon isn’t full of food, but loaded instead with an invisible power that pushes bear’s head away. We’ve been sitting like this for fifteen minutes already, the cat-sized bear cub and I: me trying to get medicated food into him, and he studiously avoiding the spoon. The bear’s face looks grotesque, his lower left jaw distended by what appears to be a huge black blood clot. His tongue and lips have been pushed off to the side by the horrible black thing in his mouth. My mind races through the options of giving the bear the powdered antibiotics mixed into the high calorie paste on the spoon: he won’t drink from the bowl; if I smear it on his paw so he licks it off, I can’t be sure he actually swallows all the medication; smearing it on the good side of his mouth with my finger also won’t guarantee he licks it off. I’m at my wits’ end. This cub won’t live if doesn’t take his antibiotics - and if he doesn’t eat more. A visit to the vet two days before revealed that he has a partially shattered lower jaw bone, which hadn’t been apparent when he came in twelve days earlier and was first examined. The little one had been doing quite well at Northern Lights Wildlife Shelter, feistily playing with his brother and eating a lot until he suddenly seemed to feel sick. When the vet showed us the necrotizing gum tissue and exposed dead bone in his mouth, I realized that I’m just beginning to understand how incredibly tough and resilient wild animals are to pain and injuries. But that won’t help this cub if he keeps wasting away because he won’t eat. I’m not getting anywhere with my attempts of giving him the prescribed medication. Angelika Langen and long-time volunteer Kim Gruijs succeed in removing the large bubble of bloody fluid in his mouth by flushing it with a saline solution, but he still needs more medical intervention. 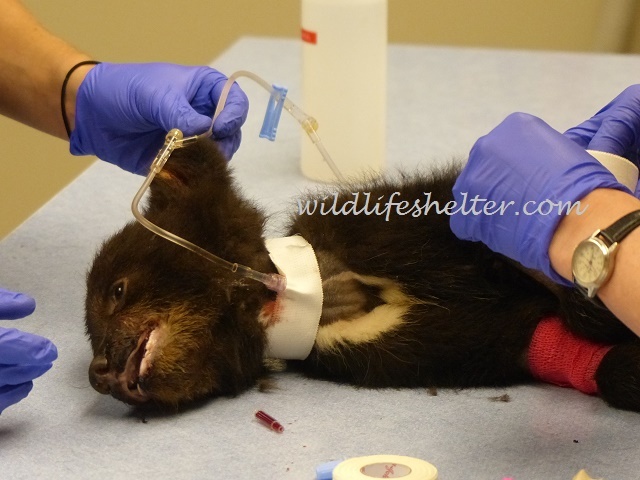 The following morning finds us at the vet again where the skinny little cub gets hooked up to IV fluids. His jaw is healing well, but he is in poor general condition. If he continues to refuse food, he will die. We are hoping that the fluids will make him feel better and help his appetite. Back at the shelter, Kim and Angelika’s daughter Tanja Landry make the decision to withhold water from the little one so milk is the only liquid available to him and he is forced to drink it. I feel uneasy about this because he has been refusing milk as well as food. What if he won’t drink it? Tanja makes the good point that he won’t survive if all he takes in is water. I have no luck giving him milk that evening. He turns away his head. It is Kim who finally succeeds in making him drink it: she squirts milk into his mouth with a syringe, forcing him to swallows it. I hold my breath when after the few mouthfuls his milky muzzle begins to look for the syringe, wanting more. It’s late at night, but suddenly everything seems bright with hope. Was it the IV fluids, the syringe feeding, or the combined effort of all of us to save his life? In the morning, the little cub sticks out his pale pink tongue and, looking back and forth between the bowl and me, starts lapping up the milk. This is the sweetest sound I’ve heard all week. You and your colleagues are truly the best. The work you are doing is wonderful. I'm so glad the wee one is mending...well done. Congratulations. You are THE best! Thanks, Jo-Anne. We are really just one part of large network of people all contributing to saving these little orphans. If it weren't for people calling in their sightings of this bear to the C.O., the C.O. 's effort to catch the cub, the supermarkets to donate their run-off produce, the money donations small and large to pay for the vet bills etc etc, this cub and all the others would never get their second chance. Every little bit that people are able to contribute in their own personal way to keep NLWS up and running is just as vital as the volunteers and staff at the shelter.